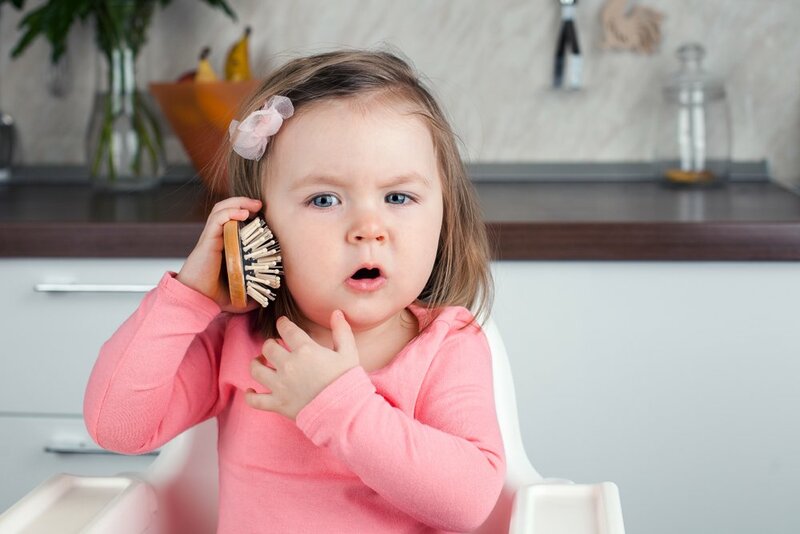 During her first years you’ll be amazed of how your little one goes from babbling to knowing how to participate in conversations. We’ve put together a talking timeline of what you can expect of your little one’s language process during this exciting time. This will give you a general idea of her progress. Remember every baby is different and develops at his or her own pace. It’s perfectly normal if your little one reaches these stages a little early or a little late. These first months are all about your baby’s sounds and gestures. You’ll hear her make vowel and guttural sounds to express herself. She’ll start experimenting with moving her arms, so you might see her shake them if something catches het attention. During these months pay attention to her facial expressions. Through them she’ll let you know if she likes or dislikes something. During this time your daughter will pay more attention to the sounds and voices she hears. At first, she’ll be most interested in the tone of your voice and she’ll start playing with the tone of her babbles as well. This is why when she’s crying and hears your soothing voice, she’ll calm down knowing you are there to comfort her. Continue paying attention to her facial expressions, because she’ll let you her likes and dislikes. She’ll become much more responsive to the sounds you make, and she’ll try to follow your lead. Try to introduce simple syllables and words; she’ll start making repeated syllable sounds. Even though you’ve been having conversations with her since she was born, your baby can now understand more than you think, so your conversations will take on new significance. She’ll start babbling while you talk; simulating a conversation. She’ll also start asking for help with her babbles and gestures. By the end of her first year she’ll be pointing at the objects she wants and imitate words you say. She’ll say “mama” and “dada” to refer to her parents and she’ll turn to familiar objects when they are named. Remember that for your child a “word” is any sound that consistently refers to the same person, object, or event. So, as your little one tries to imitate syllables and understand word phrases, you might hear “mog” every time she wants milk. You should treat “mog” as a legitimate word, but reply with “milk”. Eventually she’ll make the correction herself. Around her first birthday her words will consist of a sort of gibberish that has the variations of understandable speech. So, as long as she’s experimenting with sounds that vary in intensity, pitch, and quality, she’s getting ready to talk. During these months your little one will start answering your questions by changing her behavior, gestures, or words. She’ll be able to point to “Mom” and “Dad” and familiar objects when she hears their name. She’ll have lots of fun playing with you and pointing to animal images and imitating their sounds. She’ll start growing her repertoire of words with meaning. Around these months you’ll see her language development grow exponentially. She’ll know the names of foods and body parts. She’ll now be able to name a few of the familiar objects you play with and make simple one-word statements about what you recently did. She’ll repeat the words she hears in your conversations and start using one word to express a whole thought like “park” to let you know she wants to go to the park. By now she’ll be able to understand almost everything you say. She’ll be able to say the correct name when referring to common objects and start using possessive words, so the word “mine” might come up a lot. She’ll start combining nouns and verbs like “mommy go” to express that she wants you to come. She’ll also be able to answer simple who, what, and where questions. At first, she’ll make her own version of a whole sentence by combining a single word with a gesture or grunt. She might point and say “ball”. That will be her way of telling you she wants you to give her the toy. She might shape a question by saying “Out?” or “Up?”, raising her voice at the end. You’ll hear that her pronunciation improves and she’ll start describing an object’s characteristics with simple words like “red”. “Dada” might finally come out as “Daddy”. By this time, she’ll be able to comprehend a series of events; thus, she’ll answer simple questions about the stories you’ve read together. She’ll be able to explain her drawings and share the meaning of them with you. In addition to talking about her immediate experiences, she’ll now be able to tell you about events and people she encountered during the day. You’ll be able to carry out longer and more meaningful conversations with her. Around this time, you’ll stop being the only one that can understand your little one when she speaks. She’ll be so clear when expressing her ideas that strangers will be able to understand her as well. She’ll tell stories and learn more about the grammar rules of language. Her sentences will become more complex as she chooses the right verbs, nouns, or pronouns to arrange in the correct order. You’ll have quite the conversationalist in your hands! Remember that the best way to support her language development is through meaningful interactions. Read about this at: The influence of attention and caregiver-input on language development. You can also check how to encourage your daughter’s language development here.